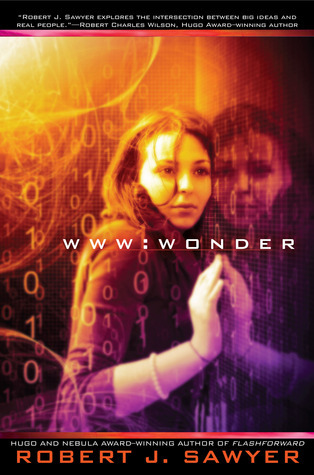 Out of all the 'W' words that Sawyer could use to describe this final book, Wonder is by far the best, it sums up how I felt about this book as I finished it up. Just thinking about the tiny little beginning of a consciousness that turns into something so big and great warms my heart. It's almost like watching a child grow into an adult that you are proud of. Honestly, however, the best part about this book is the fact that it is a positive take on Artificial Intelligence. As the series addresses over and over again, humans and media are obsessed with the thought that if AI comes into being it will try and destroy humanity, if anything that isn't human becomes as smart as human they will hate us. It brings up so much philosophical thought while reading the books. Even if you disagree that such a positive instance could happen, you are still thinking about it. I also really enjoyed how every single thread cast out in the very beginning of the series are tied nicely together in the end. From China and Japan to Canada and the US, from Hobo the Bonobo/Chimp to a teenaged girl to an emergent AI, everything is tied together. I come from this series feeling a tad smarter than when I started and a thinking a bit more about the future, about how things are changing, emergent AI aside. The scene where the kids ban together to stop the bullying by showing that they see, and because Caitlin's eye sends information through the internet, so could everyone else made me really think and wonder. Everything is becoming more out there, the internet is becoming less anonymous than it was even just five years ago, and people tend to behave better when everyone can see them and judge them. Will we as a human race become less anonymous, will our sense of moral truly improve? Will we improve as a race? There are so many more things I can talk about, but honestly I'd rather everyone read the series. It makes you think, it entertains, it teaches, it makes you fight for the underdog, become attached to a normal girl who is just growing up in a world that everyone in my generation is growing up in. Give this series a chance.